Attention all young artists: Here's a chance to have your art incorporated into the mural project we wrote about in this past week's issue. The Spokane Urban Murals Painting Collaboration invites you to share your picturesque visions during the upcoming painting project. 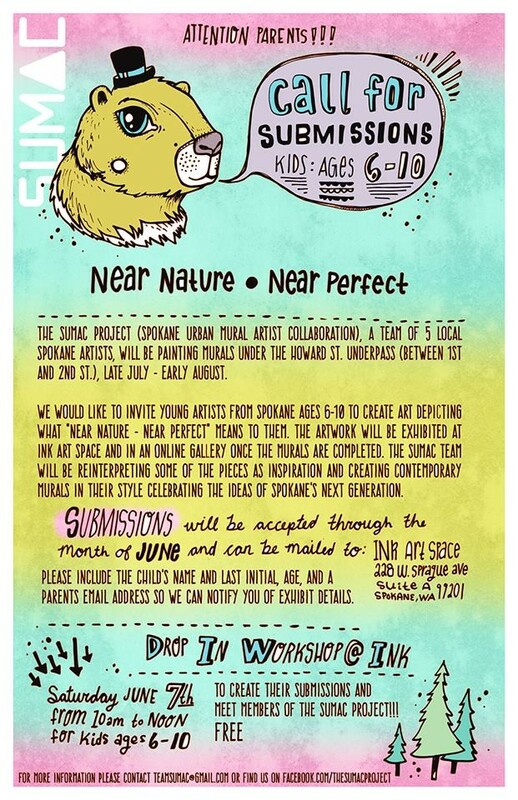 Artists ages 6-10 are encouraged to create any form of unique art displaying an interpretation of Spokane’s slogan, “Near Nature - Near Perfect.” All submissions should be mailed to Ink Art Space by June 30. The piece should be submitted with the following information: the young artist's first name and last initial, age and a parent's email address. The artwork will be evaluated by artists on the SUMAC team and used as a source of creative inspiration for the mural under the Howard Street underpass. Following the close of the project, the artwork will be shown at Ink Art Space and in an online gallery. Find more information about the project here. So, you're in the mood for... Pizza by the Slice?